After several years of work, coaster's track designs are finally ready to come to life. We know past efforts to produce wide radius curves have yielded lackluster results, and have probably left a bad taste with some of you, but I assure you, every effort has been made to guarantee success of this project. Can things go wrong? Of course, but I believe we've made every effort to mitigate those risks. There are also contingency plans in place should things go sideways. I want to stress that I believe us to be on much firmer ground than those previous attempts. This project is being broken up into multiple phases, and this is the beginning of Phase I. The offering is for 1/2 Length and 1/4 Length straights, as well as R56, R72, R88, and R104 curves (with R200 and R328 as stretch goals). All of these pieces are being offered in both all-plastic (PF) and with metal rails (9V). The success of this project will lead to Phase II, which will introduce R104 left- and right-hand switches, as well as special curves and straight segments specifically designed for use with those. The goal for Phase I is only $60,000, which will allow us to purchase the tooling and materials necessary to complete this project. Hi everyone, and thanks for the support so far! Indeed, this is the project that has consumed my evenings for the past 3 years. I suppose I just got tired of waiting for someone else to make these tracks, so I've established BrickTracks to hopefully do just that. So please, help spread the word! If you're a member of another site, post it there! Tell your LUG! If anyone has any questions or if there's anything I can do to help build confidence in this project, please don't hesitate to ask. Looks great. To be honest though I'd just be after some of them lovely look switches/points/turnouts. Are you going to be producing them? I don't see them as an option for backers. We will, but in the interest of walking before running, we're doing just the curves and straights to start. The switches by themselves are just too costly to produce without the regular track to help support it. Added more reward tiers for full circles of individual radii! Aweomse! I added a Full Circle of R56 for myself! Full circle of 9V R104 here. I've been sitting on half a loop of R104 track for years now. Been waiting ages to complete a full loop, and this may finally be my chance. Let's play a little game, shall we? I've had a number of people comment that the pricing is too high. Unfortunately, there is a sizable tooling charge we need to overcome before anything gets made, but beyond that, costs do go down. So, I'll make everyone a deal. If this gets up to $75,000 in funding, I will double everyone's reward. That's right. If you pledged for a full circle of 9V R56 curves, you'll instead get two fill circles. If this gets to $90,000, I'll triple the rewards, and if we break the $100,000 mark, I'll quadruple them. Regardless of where the project ends, there will be different colors available as well. We'll be starting with the old dark grey and the new dark bluish grey, but also light bluish grey, reddish-brown, dark brown, and black could all be options (we'll have a vote on it). Is this promise of doubling/tripling/quadrupling a calculated promise or a willy-nilly promise? Backed! Twice, actually. I wanted a set of the half and quarter-straights and a loop of r88's to compliment my ME Models r104's, though the next size up (r120?) would've been preferable - my long trains look best on long curves, especially PennLUG's grand curves. I'm excited for the additional curves, but I think I'd be more excited for the switches. To be honest I'm mostly hopeful that this gets funded so that the switches have their chance. Coaster, you've done a great job with these additional geometries, I just hope people aren't so put-off by the ME Models situation to not support this. I'd pay through the teeth for some more-prototypical switches that long cars don't look downright silly going through. Quite calculated. I don't do anything on this scale will-nilly. As I said, it's all about getting over that tooling hump. Once we get past that, costs decrease significantly to where I can do that without a problem. At worst, it takes a little longer for me to put all of them together. Thanks. I've been seeing a lot of comments about ME and other past promises of track, and I suspect a good number of people are indeed put-off by that. Nothing I can do about that though; it is what it is. So does that mean that the more funding you get now, the cheaper the final product will be overall, and we'll get a larger selection of track geometries? Coaster: could you please state the color the kickstarter rewards will be in. 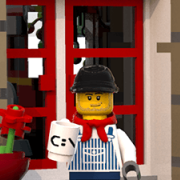 Is it possible to add logos (BT, for example) to the studs similar to the LEGO logo? It would make your products look less like Mega Bloks or any of the chinese clones. A professional look and feel is quite important to me to be honest. Also, your track pieces would blend in more nicely. Do you have a plan b in case this Kickstarter campaign fails? I never backed anything on Kickstarter but I may end up investing up to $100. Yep yep yep! Additionally, any remainder money will be immediately reinvested in switches. I will update the kickstarter, but after it is completed, a survey will be sent to each backer specifying desired color. By default though, the 9V tracks will be the old dark grey and the PF tracks will be the new dark bley. Yep, already done. I keep them off from the computer renders because embossed text patterns take an absurdly long time to compute. It also screws with the 3D printers when I make prototypes. The mark is called out on the prints. Coaster stopped by the NILTC show today at the Addison Public Library and I took these pics of his prototype R104 switches, sitting on top of modified LEGO switches. I gotta say, after speaking with Scott today at our show, I feel a lot more relaxed about backing this! He brought the switches, which are prototype 3D prints at the moment, and took the time to address our questions and concerns. Scott has back up plans in place should issues arise and he firmly believes in solid communication; he wants us as backers to be fully aware on what is going on. So, pledge. Have your clubs pledge. Call Grandma and have her make a pledge! If you have questions, just ask Scott, he is all over this thread. Those switches look really good for being 3D printed. Maybe he should post those pictures in the Kickstarted campaign so everyone can see that he knows what he is talking about, that he is actively working on the project and that this is more than just a few renders. There are a few photos of 3d prints on the Kickstarter page already.